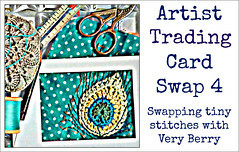 Once again I have joined up with Ali at Very Berry Handmade and am taking part in the fourth of her Artist Trading Card swaps. I love the challenge of making something very tiny - if you want, you can see some of my earlier efforts, but you should definitely check out the cards in the Flickr group where you can see ones from the current swap, both finished and in progress, and have a look at some of the others from previous swaps too. They are all beautiful and the difference in techniques and choice of subject matters is always really interesting. The theme of this swap is "getting away from it all" - to be interpreted in any way you like, so I'm having fun trying to think of things that this idea means to me, that would be in any way implementable in a 3.5 x 2.5 inch format! I've joined the swap for the first time. Now beginning to wonder how i'm going to make something so small. I love your previous cards. I don't know if I have the creativity for such a project. Hi, I'm also joining in the swap for the first time......lots of head scratching and bitten nails and a few practice cards but I'll get there in the end. I am so glad you joined the swap again! Can't wait to see your creations, Catherine!